How To Get Away With Murder is usually at its best during beginnings and ends. The season two premiere remains one of the best episodes of the series. The writers are great at setting up the initial pieces and planting the long-term mystery. Even with the season’s ups and downs, the question of who shot Annalise has been a pressing one with much higher stakes than last season’s question of who killed Sam. And Murder also usually delivers strong on the endings. Just as the writers set up the pieces with a lot of attention to detail, they knock them down just as deftly. Tonight’s “What Did We Do?” is just a midseason finale, but it certainly feels like one of those carefully executed bookends, answering the majority of season two’s biggest questions so far but also, in standard Murder fashion, introducing a new puzzle to solve. It’s not a flawless midseason finale by any means, but it does feel well plotted and like a lot of thought went into making every little piece line up just so things could go boom in the most thrilling way possible. Even the time jumps in “What Did We Do?” end up working quite well, which is surprising considering just how much the episode relies on bending time as a story device. Even as it’s switching gears at breakneck speed, the narrative doesn’t lose control when it comes to all the time jumping. The flashback sparked by the reveal that Sinclair’s already dead in Bonnie’s trunk, in fact, unfolds quite fluidly and allows the episode to cover a lot more ground. Needless to say, a lot happens in “What Did We Do?” But it’s significantly less messy than some of the middle parts of the first half of this season, especially since there’s such a clear goal, namely, escalating things to the eventual climax of #WhoShotAnnalise. And obviously, that’s the track that the whole season so far has been on. But that’s the tricky thing about How To Get Away With Murder. So much of the story hinges on the long-term mystery that it feels like we just have to keep waiting and waiting for the payoff. Sometimes I wonder what the Murder viewing experience would be like if it were a streaming show that could be binged. The show moves so quickly and yet takes its sweet time when it comes to finally making sense of things. Somet stories burn out too fast while others linger too long. While Murder is usually great when it comes to setting things up and sticking the landing, it’s all the threads in the middle that have trouble staying connected. Or they just don’t make sense until much, much later. As far as storylines that are taking too long, the mystery of Wes and Annalise’s past takes the trophy. That’s a part of the show that has become so dragged out that it’s almost hard to remember why or if we should care anymore. For all the craziness that happens in this episode, the titular line refers to the very last reveal, which sheds the tiniest amount of light on Annalise’s complicated relationship with Wes. We still don’t have all the answers, but it seems that I was too quick to jump to the conclusion that she’s his birth mother. Rather, tonight’s reveal suggests that Eve and Annalise both had something to do with Wes’s mother’s supposed suicide. So even though Annalise tells her Keating Five that they all set off a chain of unfortunate events when they killed Sam, it appears that everything really does go back to Annalise. If anyone ignited the match that set one explosion off after another in this reaction chain that seems to have no end in sight, it was her. “What Did We Do?” does rely on some of the character development that has been building all season, character work that suddenly becomes all the more urgent within the high stakes of what goes down in this episode. The season’s sudden focus on Asher Millstone, arguably the least compelling of the Keating Five, makes a lot of sense given that the events here revolve largely on his psychological undoing. While I was perfectly content with Asher back when he was little more than comic relief, his breaking point here does end up being effective and believable given everything he has gone through this season. Believable within the show’s constructed universe in which almost everyone is capable of murder, that is. But in all seriousness, Matt McGorry does some of his finest work here, viscerally showing how Asher gets pushed to the edge. He owns some of the episode’s most emotional moments. Those emotional beats are welcome and keep the episode from feeling like it’s just all plot with no feeling. 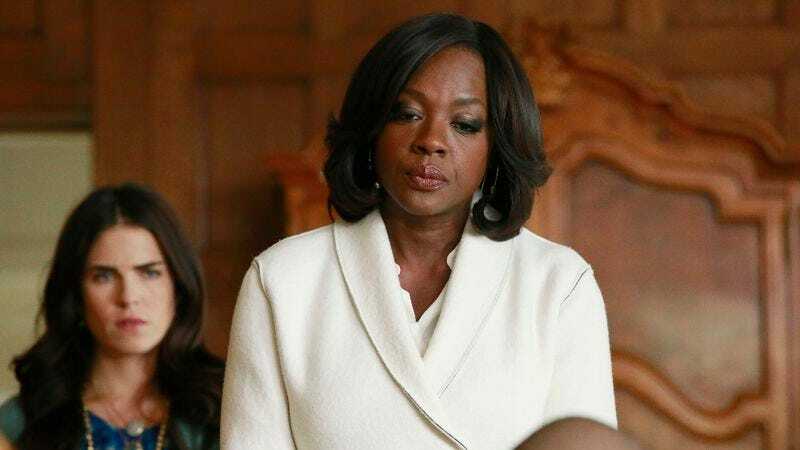 But also at a certain point, it’s hard to envision how How To Get Away With Murder can keep running when all of its characters are so tortured by trauma. “What Did We Do?” is thrilling, but it’s also so unrelentingly dark that it’s hard to get excited about the thrills. It’s easy to feel exactly like the Keating Five do when watching the show: Haven’t we been through enough? Is there no end to the misery on this show? Even Bonnie and Frank seem close to being done with their lives as Annalise’s murder minions. So how does the show keep moving forward when everyone just seems too tired, too fucked up to keep plowing through? Michaela and Connor can’t cover up another crime scene, and who can blame them? But in the style of How To Get Away With Murder, let’s jump back for a second to #WhoShotAnnalise. The episode’s climax is undoubtedly its finest moment. The second Annalise picks up that gun and calls for help, I was in it. Of course it was Annalise’s own idea to be shot to get them out of this mess. It’s batshit, but it absolutely tracks for this show. Annalise has no limits. She always has a way out. The scene turns to chaos immediately, but it’s gripping chaos that’s impossible to look away from. And again, there are emotions at play that have been building all season. Connor very seriously contemplates killing Annalise, but at the same time, he knows that pulling the trigger would just be giving into the darkness that he resents her for. His friendship with Michaela also becomes important to the scene, with Michaela literally throwing herself in front of the gun to stop him from doing it. The tension and desperation that everyone feels in the scene builds and builds so that the moment when Wes moves the gun up to Annalise’s chest hits at maximum impact. How To Get Away With Murder thrives in the crazy, shocking moments. And this one comes from a very real, very deliberate place. We won’t have any answers about Wes/Christophe and Annalise until the show returns on February 11. I guess we all have our Thursday nights back for the time being, but I’ll miss you, TGIT. Viola Davis’ performance in this episode reminds us all why she got that Emmy. Laurel is mad at Michaela for sleeping with Caleb because he is their client, but I choose to believe she’s mad at Michaela for sleeping with Caleb because she’s in love with Michaela. Annalise just straight up plops another dead body in front of the kiddos and expects them to all remain chill. Will the Keating Five ever graduate law school or will they all murder or be murdered before they get a chance? Catherine is going to have a lot of questions when she wakes up. That creepy as hell Hapstall mansion is the perfect setting for this episode.